谭云龙, 申泽薇, 余灿清, 郭彧, 卞铮, 裴培, 杜怀东, 陈君石, 陈铮鸣, 吕筠, 李立明, 代表中国慢性病前瞻性研究项目协作组. Tan Yunlong, Shen Zewei, Yu Canqing, Guo Yu, Bian Zheng, Pei Pei, Du Huaidong, Chen Junshi, Chen Zhengming, Lyu Jun, Li Liming, for the China Kadoorie Biobank Collaborative Group. Tan Yunlong, Shen Zewei, Yu Canqing, Guo Yu, Bian Zheng, Pei Pei, Du Huaidong, Chen Junshi, Chen Zhengming, Lyu Jun, Li Liming, for the China Kadoorie Biobank Collaborative Group. 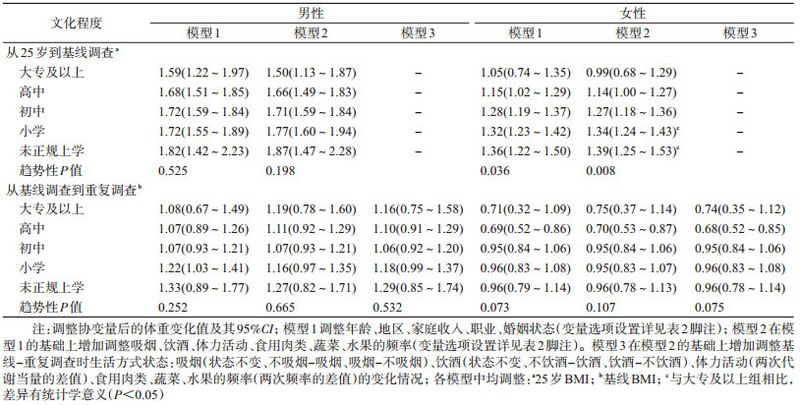 Relationship between educational level and long-term changes of body weight and waist circumference in adults in China[J]. 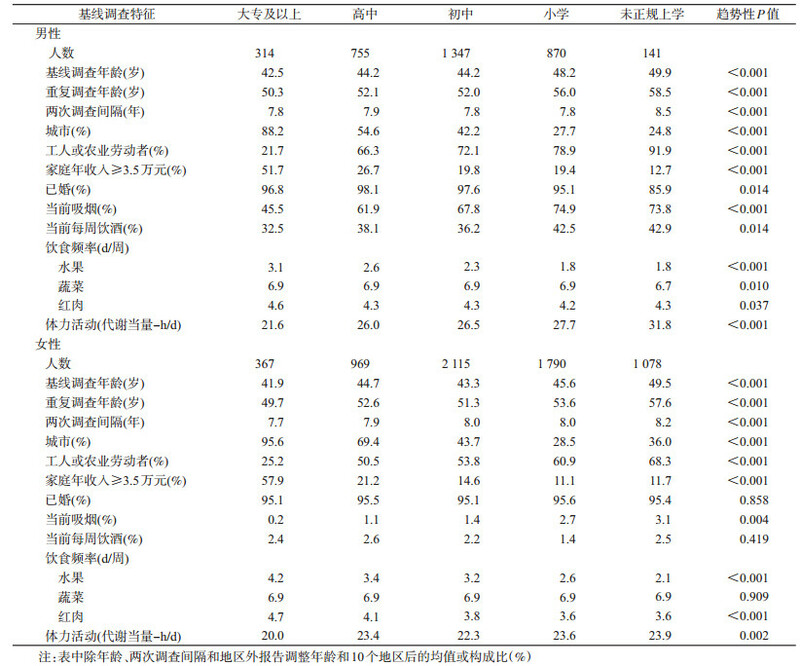 Chinese Journal of Epidemiology, 2019, 40(1): 26-32. 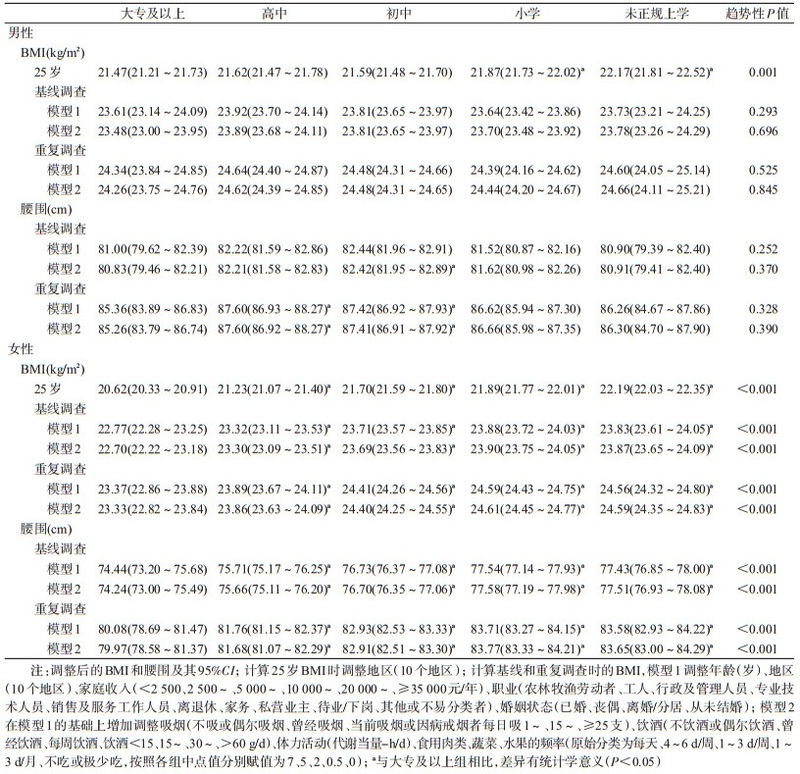 Abstract: Objective To evaluate the association of educational level with anthropometric measurements at different adult stages and their long-term changes in adults who participated in the second re-survey of China Kadoorie Biobank (CKB). Methods The present study excluded participants who were aged >65 years, with incomplete or extreme measurement values, or with major chronic diseases at baseline survey or re-survey. The weight at age 25 years was self-reported. Body height, body weight and waist circumference at baseline survey (2004-2008) and re-survey (2013-2014) were analyzed. Results The present study included 3 427 men and 6 320 women. Both body weight and waist circumference (WC) increased with age. From age 25 years to baseline survey (mean age 45.2±6.5), the mean weight change per 5-year was (1.70±2.63) kg for men and (1.27±2.10) kg for women. From baseline survey to re-survey (53.2±6.5), the mean changes per 5-year for body weight were (1.12±2.61) kg for men and (0.90±2.54) kg for women; and that for WC was (3.20±3.79) cm for men and (3.83±3.85) cm for women. Among women, low educational level was consistently associated with higher body mass index (BMI) and WC at age 25 years, baseline survey and re-survey. Among men, low educational level was associated with higher BMI at age 25 years. At baseline survey and re-survey, the educational level in men was not statistically associated with BMI; but men who completed junior or senior high school showed slight higher WC and increase of WC from baseline survey to re-survey than other male participants. Conclusions Body weight and WC increased with age for both men and women. The associations of educational level with BMI and WC were different between men and women. 孔国书, 齐亚强. 影响居民肥胖的社会经济因素:性别与城乡差异[J]. 社会学评论, 2017, 5(5): 79-96. Monteiro CA, Moura EC, Conde WL, et al. Socioeconomic status and obesity in adult populations of developing countries:a review[J]. Bull WHO, 2004, 82(12): 940-946.